AQ750L - G & W Machinery Sales, Inc. The AQ750L Wire EDM features Sodick’s Linear Motor Technology. The AQ Series is Sodick’s line of large work area and extreme taper Wire EDMs. The AQ750L features a fixed table design which allows for a workpiece with greater weight to be machined without affecting the table positioning or workpiece accuracy. Need a larger Z-Axis? Call and ask about our AQ750LH. The AQ750LH features a 24.00" (600 mm) Z-Axis. 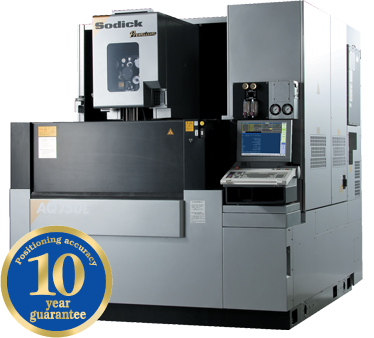 Sodick’s AQ750L Wire EDM features linear motor drives. Linear motors provide smooth, vibration-free table movement, which results in unsurpassed positioning and machining accuracy. Since there are absolutely no ball-screws or couplings, backlash is completely eliminated. With the use of linear glass scales in the X, Y, U and V axes, precision positioning accuracy with direct feedback is accomplished. This allows for unparalleled straight and taper cutting accuracy. The longevity of this system is unmatched by anyone in the industry – and comes backed with a 10-Year Positioning Accuracy Guarantee. The AQ750L Wire EDM uses a high-speed generating LN Series control with a Windows platform. The system was designed to provide a user-friendly environment for the operator and still have the high-level functionality that is required in today’s demanding world. The control is network capable, this allows for NC sharing, remote monitoring, and messaging via LAN (option). The LN Series Control automatically generates cutting conditions, offsets corner control settings, wire speed, wire tension and other data necessary for proper operation. This is especially helpful to novice EDM operators, since no prior knowledge of EDM is needed to achieve excellent results. 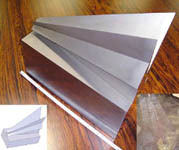 The AQ Series features energy-saving designs and technologies. Compared to conventional Wire EDMs, the Sodick Wire EDM Range can reduce average energy consumption by up to 60%. Submerged machining capabilities greatly enhance the cutting performance in applications where poor flushing conditions exist. The AQ750L allows for submerged machining which greatly enhances workpieces that are irregular in shape, or that require taper angles. This is done because the work zone is thermally stabilized, thus achieving higher cutting accuracy. On the AQ750L the actual wire tension is measured just prior to entering the cutting zone – at this point all adjustments are made automatically. This eliminates tension variations due to taper cutting, varying spool sizes, etc.